Congratulations! They have been placed on an American Cruise Line, much before their course was completed! 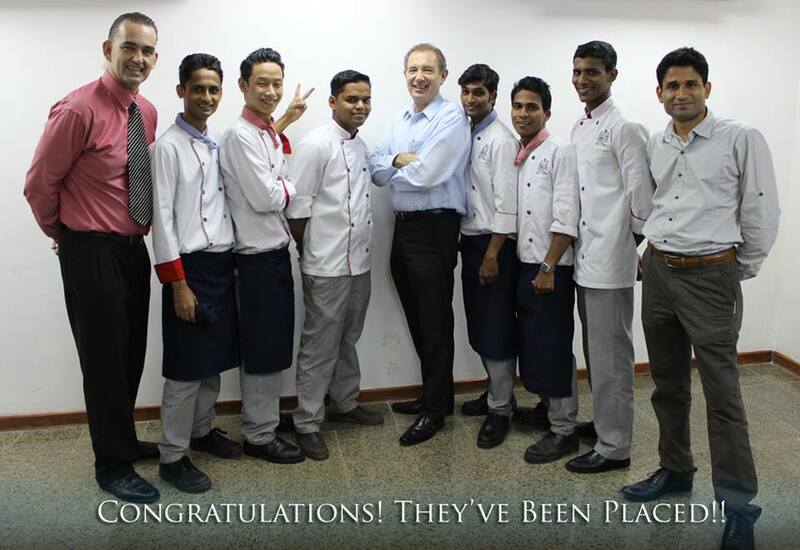 Our Executive Cruise Culinary Program 1st Batch students selected on 24th July 2014. Awesome Work Boys! All the very best to all of you, Dip Thakur, Walter Godinho, Charles Fernandes, Broy Fernandes & Joffy! Come join our extremely successful 100% assured placement, Cruise Culinary Chef 3 Month Course. Contact us for more details. Cruise line career opportunities by Accla. This entry was posted in Chef Jobs, Cruise Placement, Cruise Ship Jobs, Hot Jobs, Success Stories and tagged 100% placement, accla, American College Of Culinary & Language Arts, Cruise Ship Placement on January 27, 2015 by admin. After the economic meltdown that struck in 2008, the world looks at employment opportunities in a very different manner. Some organizations changed their recruitment policies and brought in stricter rules, regulations and amended their employment policies, while other organizations used it as an excuse to take bribes and make false promises. Seeking employment in the country today can be very difficult and pose a challenge because not only is the selection criteria is a bit more on the tougher side, but also the amount of candidates applying for any given position is far more greater than the actual number of positions available. This puts a lot of pressure on the Human resources manager who has to carefully select the candidate, after screening through a maximum number of resumes to find the perfect fit to that particular organization. At Kamaxi Overseas Consultants, we pride ourselves on the work that we do. We recruit candidates for all hospitality positions in the Middle East such as the United Arab Emirates, Bahrain, Kuwait, Qatar and Saudi Arabia. Selections for qualified candidates are strictly on a professional basis and candidates are judged in line with their qualifications and work experience. These candidates go through a round of interviews with the Human resources manager and it is only after passing these interviews that they are put through the final round of interviews with the principal employer who comes from overseas to interview and select the candidates for their organization. For all culinary positions candidates not only have a verbal interview to attend, but they have to be prepared to undergo a trade test for the requested menu to be prepared, that is judged by the Dean of the college along with his army of Chefs. One of our principal employer is world renowned Lenotre, who have a chain of restaurants not only in Paris and Cannes in France, but also in Kuwait, Jeddah, Bangkok, Riyadh and Doha. Highly known for its authentic French cuisine and fine dining, we have regular visits from the Chefs of Lenotre who come especially to select some of our best candidates for their exclusive properties. At Kamaxi Overseas Consultants we provide a variety of candidates who are trained and qualified in fields of bakery, confectionary, and other culinary operations. Given such a big option to choose from, the Chef’s obviously have a very difficult decision to make while selecting the right candidates for their prestigious organization. We display the best of our candidates to our clients without cutting any corners or indulging in foul play or illegal activities. At the end of the day the recruitment team is amazed by the choice of candidates we provide for their selection and approval and find it highly challenging to pick out the perfect one that would be an asset to their culinary teams. We also have selections from the Flora group of Hotels who recruit our staff for their prime properties within the United Arab Emirates. The selection’s by the Flora group is not just confined to the culinary side of operations but there are vast options within the Front Office, Housekeeping and Food & Beverage departments as well. Once our candidates have been pre-screened and approved by our recruitment team, they are then physically interviewed by our HR manager and only after an approval by the Director their resume is scanned and sent across to the recruiting company, who in turn will schedule a Skype interview with the candidate should the employer not be able to physically attend the interviews in the country. Once interviewed by the employer and if the candidate is approved for employment with the company, then we at Kamaxi Overseas Consultants will provide all information and support from receiving the employment contract to ensuring that the visa and airline ticket is processed and medicals are carried out, to making sure that the candidate is on the flight to successfully join his new company overseas. At the end of the day we are happy and pleased that we are able to assist our candidates in their search for employment and they in turn will recommend us to their friends and family. If you are looking for a cruise ship career, then look no further. Join the American Culinary and Cruise Line Academy and get yourself an employment opportunity within the cruise line industry. Not only will you earn yourself a diploma but you will now have the privilege to travel and see the world for free. The American Culinary and Cruise line Academy is the brain child of the Director, Mr. Parixit Pai Fondekar who realized that there was a vast amount of potential young candidates in the country who were very eager to join the cruise lines. Today’s cruise lines call for the best, experienced and qualified staff to be part of the cruise line team and so he created a program to educate candidates in the art of cookery so that they would be well prepared prior to them boarding that cruise ship for the first time. Putting together all his financial resources and all his experience of culinary operations Mr. Fondekar established his very own culinary school in Margao, Goa. With a highly qualified team of engineers and chefs he was able to set up the culinary school similar to those as found onboard the cruise ships keeping in mind every safety and security regulation and making sure it would pass United States Public Health inspections should the need arise. The institute is made up of a Garde manger, a hot kitchen, butchery, and a stewarding area for washing and cleaning of the dishes. Besides having state of the art equipment necessary for running a smooth operation, the galley also boasts of the most sophisticated and modernized equipment such as a walk- in freezers, a buffalo chopper, tilting pans and an alto-sham for grilling foods. For baking purposes, there are heavy duty mixers for mixing the dough and convection ovens for baking them. There is also a conveyor oven especially for the baking of pizzas, etc. Hygiene and Sanitation also plays a very important role at the American Culinary and Cruise Line Academy. That is the reason we practice the same cleanliness as we do onboard the ships. Our students are trained in USPH policies and taught the three bucket system for washing, rinsing and sanitizing their equipment and work stations. Maintaining food temperatures and procedures to handle meats and raw foods are also practiced at the institute. Health is given a priority at the institute and students are asked to refrain from attending classes if they are medically unwell as we would not like other students to catch the sickness too. All students are requested to get a medical check done prior to joining the culinary course in the college. This is to ensure that no student is a carrier of any sickness or disease while working in a food production unit. The college provides first aid for minor situations such as burns and cuts. After completing his culinary program and before joining the ship, the candidate has to undergo another medical so that he can be certified that he is medically fit for the company. All rules and regulations at the college are similar to those on board the cruise line. Students need to be well groomed and points are deducted if he is inappropriately dressed or not groomed well enough. Punctuality is also very important and students are fined if they are late to class. Eating in the galley is strictly prohibited and this is in accordance to the USPH principles which is strictly maintained in the college. However not everything is work at the American Culinary and Cruise Line Academy. The institute has a lot more celebrations too. While Diwali, Christmas, Independence day are some of the holidays that are celebrated, celebrations are also in place for the students birthdays, which includes a birthday cake and some treats made by the chefs of the college to make that student feel a bit more special. The college also has an open day where families and friends can visit the institute to witness and sample some of the dishes whipped up by the students at the institute. At the American Culinary and Cruise Line Academy, work is our motto and we strive to be the best! This entry was posted in Chef Jobs, Cruise Placement, Cruise Ship Jobs, Hot Jobs and tagged accla, American College Of Culinary & Language Arts, Cruise Ship Placement, kamaxi overseas consultants, koc on January 17, 2015 by admin.